Please alert the recipient that a perishable gift is being delivered, Everyone is sad when a package sits at the post office or mailbox for days. Please contact us for special shipping requirements and we will quote the shipping charge. Normally expedited shipping is several times the standard cost. We ship bacon, sausage, and ham products every Monday-Wednesday. Shipments made Thursday through Sunday will be held until the following Monday to be shipped. This allows packages to be on the move everyday in transit. This avoids the packages sitting in hot warehouses or trucks during the weekends. If your package can ship on a Tuesday or Wednesday and arrive before the weekend, it will ship if not it will be held until the following Monday. *All wine orders require an Adult Delivery Confirmation. If you buy anything containing wine (alcohol consumption), an adult (person over age 21) MUST sign for the shipment in order to receive it. If there isn't an adult to sign for the package, it will not be left at the doorstep and you must call the appropriate mail carrier to receive it. If no one is available to sign for the package, the carrier will attempt to re-deliver it the next business day. No refunds will be given for packages in which an adult isn't available to sign for the package. In addition, we offer Broadbent's Country Ham Center Slices which are also shelf stable and can be shipped to APO, DPO and FPO. Our sausages all require refrigeration and are not shipped beyond the continental US. When the items arrive, we suggest you refrigerate or freeze if you will not eat within two weeks. All products are USDA inspected and meet all USDA shipping requirements for safety. Please do NOT send Pork products to a soldier in Iraq or Afghanistan. Packages are scanned and these items WILL be confiscated. Unfortunately at this time, we are unable to ship any items outside of the United States except our special flat rate items to Canada. Delivery times cannot always be guaranteed due to outside forces during its transit. If the shipping carrier delays your transit due to the following, we (and the shipping carrier) is not responsible: Acts of God, weather conditions, environmental or dangerous goods incidents, perils of the air, public enemies, public authorities acting with actual or apparent authority, application of security regulations imposed by a government or otherwise applicable to the shipment, acts or omissions of customs officials, authority of law, quarantine, riots, strikes, work stoppages or slowdowns, or other labor disputes or disturbances, civil commotions or hazards incident to a state of war, local or national disruptions in ground or air transportation networks or systems due to events beyond the shipping carrier's control, disruption or failure of communication and information systems, disruption or failure of utilities, or any circumstances beyond the shipping carrier's control. We are not responsible for delays due to "missent" errors on items shipped with USPS. You will be refunded a pro-rated amount for the remaining months of your club.Cancellations must also be made before the 25th of the month due to shipment processing dates. When your order has been sent you will receive an email confirming that it has been shipped and will include a UPS or USPS tracking number. You can track your order directly on www.UPS.com, www.USPS.com. Input the appropriate tracking number into their tracking feature to find out where your order is at any given time. We are not responsible for any lost, stolen, or damaged packages during transit.If there is information from your local post office to show that the package was delivered and you say that you did not receive the package, you will need to contact the appropriate shipping carrier yourself to initiate a claim for the lost package. Once a package has left our facilities, it is the responsibility of the shipping carrier as they are a separate business from our own. In the event that we oversell or are short an item, these items may be backordered, and we will contact you immediately. We will give you the choice to ship out your order when the order is completely filled; cancel the backordered item, or send you the backordered item when it comes in. If your order includes available items and you would like those items to be sent immediately; please note this in your order. Exchanges and Store credits can only be given for non perishable items within 14 days of the purchase date. There are NO exchanges on perishable items. Simply mail the products you would like to return back to us (with a note of reason for return enclosed) at our address listed at the bottom of this page. We'll refund your money via charge or check, depending upon how you paid for your order. Non perishable item returns can be sent for exchange, store credit or refund depending upon your preference. We regret that we are unable to refund your original shipping charges unless the return was a result of our error. You are also responsible for the shipping fee for the returning product. For any discrepancy, please report it to us within 48 hours of receipt of product. Otherwise, we will assume that there is no problem with the order. Examples of discrepancy include wrong item, wrong quantity, and/or the package received does not match the order you placed. For any return, please email Christa@bacofreak.com or call (805) 435-6691. Please make sure the item is in its original resalable condition. For all U.S. domestic online or phone orders; item must be returned within 14 calendar days from the date we shipped it out. Approved refunds and exchanges (depending upon available stock) will process within 1 week upon receipt of the returned package, if not sooner. For all exchanges, you must return the item to us before your new item can be shipped out to you. If you do not want to wait that long for the new item, you can purchase the desired item you want to exchange, and we will refund the old item once we have received it. For approved refunds, resulting from our error, cost of the item will be refunded. For all other approved refunds, only cost of the item will be refunded (You will be charged a 15% restocking fee). Shipping costs (both ways) will not be refunded. All approved exchanges will be reshipped for a small fee. Customer will pay for the return shipping and any incurred cost of exchanging (ex. difference of item cost). If you have received an ordered clothing item and would like a different size, you must reship the clothing item back to us before the new desired size can be shipped out to you. You are responsible for both shipping fees. (Cost of return shipping and cost of shipment for the new item.) The new, desired items' shipping cost will be a $5.00 fee per t-shirt and/or apron; and a $10.00 fee per sweatshirt. You can make note in your reshipped order if you would like this charge applied to the credit card you used for the original transaction; or you can call us to use a different one. Clothing items that are returned for an exchange in size must be in perfect condition. If you would like a refund or exchange of a clothing item that was damaged during transit you must file a claim with us within 48 hours after arrival, take a picture, and e-mail it to us immediately so we can begin the approval process. Damaged clothing items will not be exchanged or refunded if no file has been claimed and then approved of. A return label will only be issued when exchange reason was due to our error. If a package is returned due to a missing adult signature; it was unclaimed, customer was not at the address or refused the package, we will not reship. The order may only be refunded for the cost of the item, minus a 15% restocking fee. If you still need the items, we can reship them for a fee. We are not responsible for any error during transit caused by the shipping carrier. If the shipping carrier agrees to a refund we will process the refund based on their decision. Please note; if you return an item that qualified for free shipping, our actual outbound shipping costs will be deducted from your return refund. If an item is returned as a result of an incorrect address provided by you, we can reship the product to the correct address at an additional cost to you. (Note there is also a $14.00 fee charged by the carrier.) Returned perishable items are not able to be repackaged and shipped; therefore you will be responsible for the cost of the new product and the new shipping charge. To return a package: Please read and follow the below Return procedure before sending any package back to us. Complete return/exchange reason on the backside of the invoices. Package must be returned in its original package or in a plain box. Make sure the merchandise is properly packaged to avoid damage during transit. Return the package, and email us a tracking number. We do offer replacement for any damaged or defective orders as long as the claim is placed within 48 HOURS of the order being received. All damage claims must be reported to us via email through our Contact Us page or within 48 HOURS by phone. Note: Replacements will only be issued if damaged or defective orders are verified by internal policies that will require you to submit a photo of the damaged product. We are not responsible for lost or stolen packages after delivery. Most often, our delivery carriers (UPS, USPS) have a signature release waiver on Standard-Ground shipment, and will leave packages at their own discretion (front porch, back door, neighbor, other secure location, etc.) Wine is excluded as it requires an adult signature. Expedited shipments may require a signature depending upon the carrier. Delivery tracking information is provided on all packages. In the rare event that an item is missing from your order, you must notify customer service within 48 hours. Because of the popularity of our products at times we may need to substitute items in certain gift bundles. We also make changes to our inventory based upon discovery of new and unique items, product availability, and seasonal difference. Therefore, substitutions may be made, but quality will never be compromised. BaconFreak.com reserves the right to substitute products. 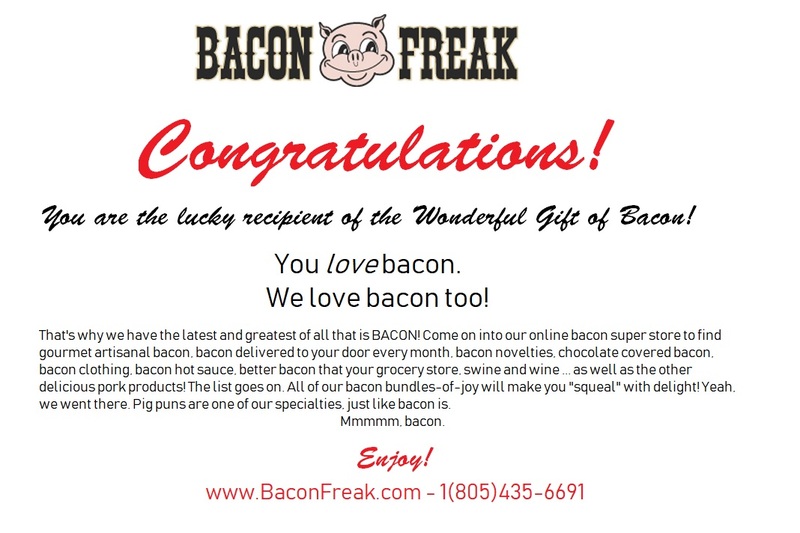 We take pride in our customer service at Baconfreak.com and this includes not only the quality of our products, but also the speed of our service and shipping. Keeping this in mind, we require that any cancellation be made by 1 pm PST the same day as you place your order. * However, the majority of our orders ship on the same day they were placed. Otherwise, you will be subject to a non-refundable handling fee and service charge equal to 15% of the total order. *Once a tracking number has been generated on your order, you cannot cancel the order without paying the 15% service charge. The 1 pm PST cancellation does not apply to orders when same day shipping has been requested, or the order has already been approved and shipped. In the case of a same day shipping request, all orders must be canceled within 3 hours of order confirmation or be subject to the same restrictions outlined above. All cancelled orders placed with a credit card that have already been processed will be subject to a $6.00 cancellation fee. Once an item has been shipped, it can not be changed or refunded.